Steven Mullaney admitted there was a sense of frustration in the home dressing room after Joe Root and Gary Ballance arrested Nottinghamshire’s push for victory on the final day of their Specsavers County Championship clash. Jake Ball saw off the Yorkshire opening pair of Adam Lyth and Harry Brook in the opening hour of the day’s play, before Root and Ballance put on 253 runs together, a record third-wicket partnership for Yorkshire against Nottinghamshire. “I’m not sure we could have done any more,” said the Notts skipper. “[Root and Ballance] are two very good players, so you’re going to have to have a good ball, a piece of brilliant fielding or a bit of luck to get them out. Nottinghamshire’s second-innings declaration came before the start of play on the final day, leaving Joe Clarke not out on 97 after making a century in the first innings. Having sounded out Clarke after he stepped off the field at the end of play on day three, Mullaney said the decision was the right one for the team. “I don’t think they’d have let us go out in the light with the new ball if we’d declared yesterday afternoon, and I wanted at least 420 on the board," said Mullaney. Clarke’s contribution with the bat was well-supported by scores from Ben Slater, Ben Duckett and Mullaney himself. But the captain singled out Chris Nash for particular praise after his second-innings 75. “It was really nice for Nash to get a score. He’s been getting a few 20s and 30s in pre-season, and again in the first innings here, he said. 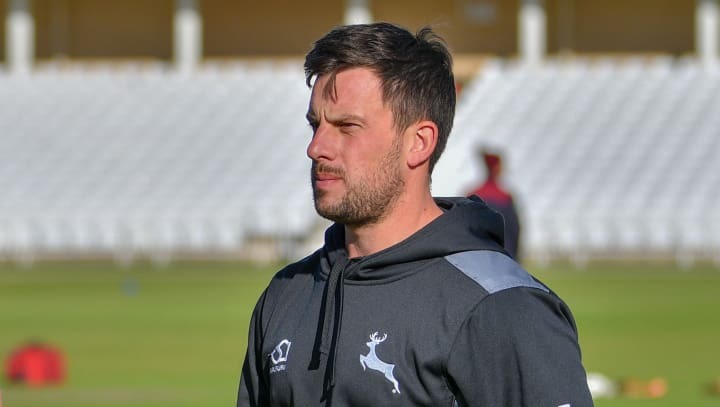 Somerset travel to Nottingham for the next County Championship fixture on Thursday, and Mullaney feels this first game has produced plenty of positives. “If we play the brand of cricket we’ve played in this game all year, we’ll get those little breaks that you need sometimes to win games of four-day cricket, and we’ll be there or thereabouts," he said.